PRIDE OF OWNERSHIP! 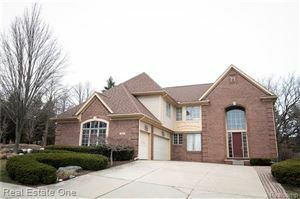 Bright open floor plan, white kitchen, open concept ranch home in Sterling Heights. Meticulously maintained, 3 Bedrooms, 1.1 Baths situated in prime location, close to schools, shopping, easy access to freeways for a convenient commute. Many features detailed this lovely home include vaulted ceilings in Family room, Kitchen and Bedrooms, all new carpet on main floor, new doorwall & living room window, new furnace. Appliances are all included. Finished basement with bathroom, large rec room and additional 4th bedroom/hobby/office/fitness room for additional living space. Beautiful fenced private yard with newly professional landscaping. 2 car detached garage. Must see! Utica Schools. OFFER DEADLINE THURSDAY 6/7/2018 8 P.M. The data relating to real estate properties on this website was last updated as recently as 4/23/19 3:37 PM PDT.